Show you claim something as a trademark? Do you have to register trademarks? How can we protect trademarks in social media? And more trademark questions answered by entertainment lawyer Gordon Firemark. A distinctive brand or title to identity a product, service, or company. 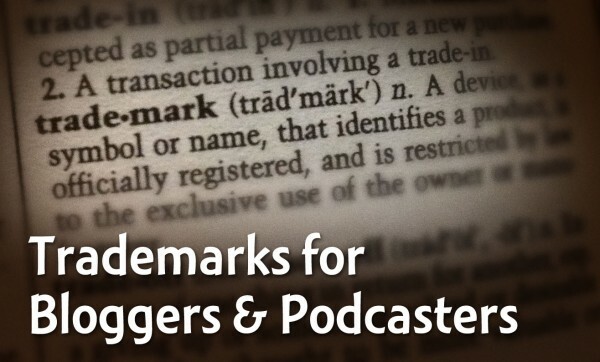 “Descriptive” titles, like “how to podcast,” are difficult to trademark until it's well-known as associated with a particular company or person. Should we trademark our own stuff? How do we claim something as a trademark? Trademark registration gives broader rights and protections to the trademark-owner. But it could cost about $1,000 per trademark. How can we protect our trademark? Lanham Act established trademark protection, even if your mark isn't registered, against people competing with you. If someone just uses the descriptive words of your trademark, it's permissible. But if they are titling something with the same trademark, then you have the right to ask them to change it. Sometimes, they'll be respectful, sometimes not. Always start with a pleasant, respectful request. Claiming a trademark means you're obligated to protect it, even an unregistered trademark. If you don't protect your trademark, you'll lose it. What if we haven't indicated our trademarks? The symbols aren't necessary for unregistered trademarks, but it's a recognizable way to notify the world that you're claiming the trademark. But if you have registered your trademark, you are required to indicate the registration. Most social-media companies have clear policies for protecting registered trademarks. Often, they'll also respect unregistered trademarks if you can demonstrate you're entitled to it. I've found that other services, like Instagram, have no protections for trademark violations in their service. It's totally first come, first serve. Register your “trademarks” in any legitimate-looking service you find pop up.